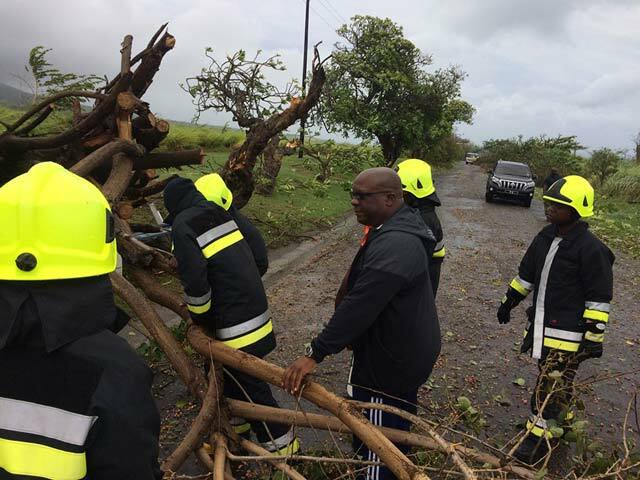 Basseterre, St. Kitts – Essential service employees, including security and safety officials who went beyond the call of duty, will receive a monetary reward from the government for their tasks performed during the passage of hurricanes Irma and Maria. He then announced an incentivized monetary reward for those workers. “We have decided to incentivize and to provide a monetary reward for our essential services workers who went beyond the call of duty during and immediately after the hurricane,” he said. Those workers who will benefit from the incentive include the police, defence force, fire and rescue services, NEMA, the Health Department, the Public Works Department, the Water Department, St. Kitts Electricity Company Ltd (SKELEC), St. Christopher Air and Sea Ports Authority (SCASPA) and ZIZ Broadcasting Corporation. The prime minister also announced that countries across the region recently ravaged by recent hurricanes will also received a financial contribution from St. Kitts and Nevis, although admitting the existing challenges here in St. Kitts and Nevis. “Notwithstanding our own fiscal challenges of treating with our recovery efforts, cabinet, on Sept. 22, approved some measure of monetary support to our neighbours,” Harris said. He said the federation will pledge to Dominica $1 million and additionally declined the EC$0.5m pledged by Dominica to St. Kitts and Nevis after Hurricane Irma. “We nonetheless thank Prime Minister Skerritt for his kind consideration,” Harris said. The prime minister also pledged $0.5 million to the British Virgin Islands; $0.4 million to Anguilla, Antigua; $0.4 million to Barbuda; and $0.2 million to St. Maarten. “I take this opportunity to pledge the support of the government and people of St. Kitts and Nevis to the Commonwealth of Dominica,” Harris said. “My cabinet and I have reached out to Prime Minister Roosevelt Skerrit and his government, as was extended to Anguilla and other islands that were previously impacted by Hurricane Irma. We have offered the use of the RLB International Airport as a staging platform for relief efforts into Dominica in the wake of Hurricane Maria. n addition to this, all four hospitals on St. Kitts and Nevis will be made available should the need for health services be required. Places will also be made available to accommodate displaced students in Dominica who are registered for upcoming CXC exams.” He added that the students will be offered free enrollment into our schools until their own high schools are ready to accommodate them. “Furthermore, our federation will assist in the restoration of electricity supply to Dominica, and our Coast Guard vessels will assist with transportation where possible,” Harris said. The prime minister also spoke of the federation’s fortunes in this hurricane season not to suffer similar fates as neighbouring territories. “The Lord God has given the people and the federation of St. Kitts and Nevis His boundless mercy and grace, and, in return for his protection, we offer ours, as well as compassion, to the least fortunate and the most vulnerable of our neighbours. Today it is they who are in grave need. Tomorrow it could be us.